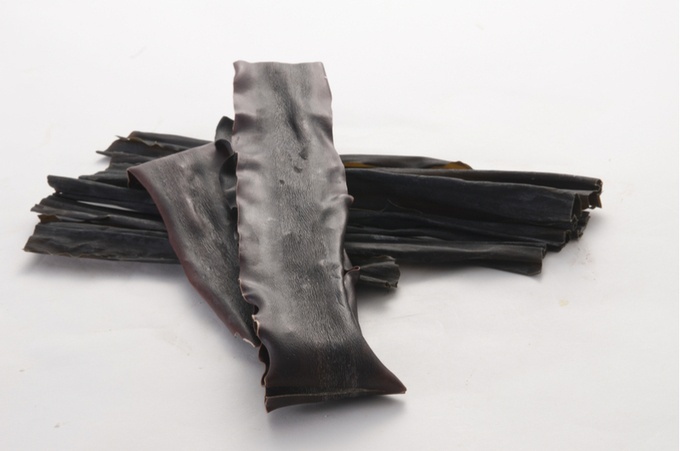 Kombu Seaweed: The Umami Superfood! Sure, when it’s in the sea it might not look very appetizing, but several types of seaweed are delicious when prepared properly. Not only that, but seaweed is packed with nutrients. Take the edible kelp known as kombu, for example. Kombu can be found right off the coast, and there are literally kelp forests packed full of it. Kombu is known for its ability to improve digestion. Packed with amino acids and glutamic acid, eating kombu helps your body break down foods easier and minimizes both intestinal gas and discomfort. Sea vegetables like kombu may also help prevent cancer, thanks to their anti-inflammatory benefits. Kombu contains iron, which is a vital mineral for healthy cells, hair, nails, skin, and more. It’s common for people to have an iron-deficient diet, which leads to fatigue and other anemic symptoms. Adding kombu into your diet is a great way to ensure that you’re getting enough. Kombu is actually the highest in iodine out of all edible seaweeds. In fact, it’s one of the most iodine-rich foods out there. Why is this important? Well, iodine improves thyroid function and is an essential mineral for healthy hormone production. Our bodies do not naturally produce iodine, meaning it’s essential to eat iodine-rich foods like kombu in order to maintain a healthy thyroid. Lastly, kombu contains a sulfated polysaccharide known as fucoidan, which has been proven to stave off cell inflammation. Therefore, researchers suggest that eating kombu may be a possible treatment for the symptoms of rheumatoid arthritis. And we haven’t even mentioned all of the vitamins, calcium, and proteins that are found in seaweed! Now that you know all about why you should eat kombu, let’s go over a delicious recipe for you to enjoy. • Take kombu out right before the water begins to boil and enjoy the dashi! Kombu is famous for its umami flavor, and it is used in Japan to make dashi, which is a soup that can also be used as cooking stock. Dashi is actually the base for many Japanese dishes, including miso soup. While several kinds of seaweeds can be used to make dashi, kombu is one of the tastiest and healthiest choices. Once you’ve made your kombu dashi, you can store it in your fridge and heat it up when you’re in the mood for some delicious hot soup. Or, you can use it as stock to cook with. It’s an excellent stock alternative for vegetarians. Plus, its unique umami flavor is fun to experiment with and can really open up your cooking options. Of course, there are plenty of other ways to enjoy the taste and health benefits of kombu than dashi. Kombu can be dried, made into powder, and pickled. It’s even eaten as sashimi in Japan. So, pick up some kombu today and start enjoying its health benefits and unique flavor! Ready to get out there and collect your own? Our Seaweed Adventures on the Sonoma coast are great for the beginner or veteran forager. Click below for dates and see you on the beach!